January 27th, 2019 5:30 pm as we celebrate José Julián Martí Pérez’s 165th birthday. 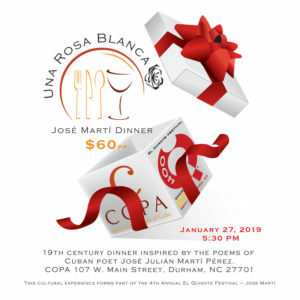 Chef Roberto Copa Matos prepares a very special, 19th century dinner inspired by the poems of Cuban poet José Julián Martí Pérez. 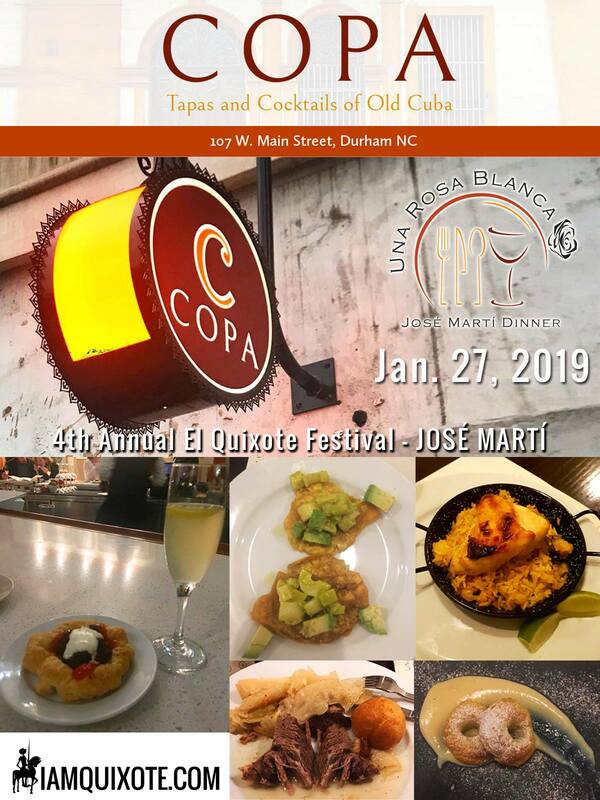 Artist Studio Project in collaboration with Copa tapas and cocktails of Cuba in Downtown Durham is excited to bring you a 5-course wine dinner inspired by the poems of Jose Martí. “Una Rosa Blanca” – Welcome cocktail featuring Durham Distillery American Dry Gin, St. Germaine Elderflower Liqueur, fresh lemon, fresh lime, organic cane syrup, rose water. “Dos Patrias: Cuba y la noche“ – Black bean tartlet with creme fraiche foam and red pepper jam. “Orilla de palmeras” – Tostones with heart of palm and avocado salad. “Cop(p)a con alas” – Coppa braised in duck fat. “Un ave de oro” – Saffron rice with dried figs and glazed chicken. “Para Aragón en España” – Almojábanas aragonesas served on a bed of natilla. Wines will be provided by the illustrious Laurence Vuelta, importer for Aveniu Brands. Laurence is a dear Cuban-American, friend of COPA and an avid admirer of José Martí. Together, Laurence and Rafel Osuba, the founder of the I Am Quixote festival, will be your guides on a poetic journey through 19th century Cuba. Space is limited only 44 tickets available and trust me they will go fast.